The life of a working class couple living in London and their complicated relationships with other members of the family. A shop assistant, her cook husband, & their twin daughters ponder their lives over a few weeks in a working-class suburb north of London. 2 young women reunite and rekindle their friendship after having said goodbye at their college graduation, six years earlier. In a poor working class London home Penny's love for her partner, taxi-driver Phil, has run dry, but when an unexpected tragedy occurs, they and their local community are brought together, and they rediscover their love. Moments from the uncompromisingly bleak existence of a secretary, her intellectually disabled sister, aloof and uneasy teacher boyfriend, bizarre neighbor and irritating workmate. When one brother gets a job from their wealthy aunt, the other becomes increasingly jealous. A successful black woman discovers that her birth mother is an underprivileged white woman, but the woman denies it. As emotions run high, everyone's secrets are exposed. Set in the 1880s, the story of how, during a creative dry spell, the partnership of the legendary musical/theatrical writers Gilbert and Sullivan almost dissolves, before they turn it all around and write the Mikado. Abortionist Vera Drake finds her beliefs and practices clash with the mores of 1950s Britain--a conflict that leads to tragedy for her family. A Catholic and a Protestant couple in Northern Ireland have amazing parallels in their lives, despite being either side of the divide. Rupert Boothe-Braine: Now... what made this country great was a place for everyone, and everyone in his place. And this is my place. A Fully Developed Creative Process. 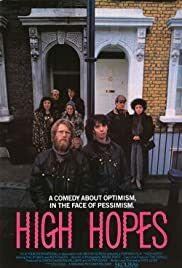 HIGH HOPES provides most strengths and few weaknesses of its superb director, Mike Leigh, with the former category including his choice of footage from a typically improvisational collection of scenes; avoidance of a formulaic scenario when comparing and contrasting three widely disparate but plot-connected couples, in a Margaret Thatcher administered England; skill in controlling mood adjustment and visual constructs that generally serve to intensify viewer response; and his canny employment of technicians to implement effective staging design. 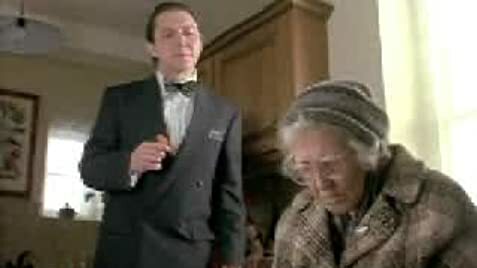 Leigh's bent toward usage of politically charged economic allusions as a referent to class structure and social change leads here to role stereotypes, indeed even caricature, during scenes wherein emphasis is upon parody, as only one of the couples, former Hippies Cyril (Philip Davis) and Shirley (Ruth Sheen), is permitted to display humanity whereas Shirley's brother Martin (Philip Jackson) and his wife Valerie (Heather Tobias), along with the gentrified Booth-Braines (David Bamber and Lesley Manville) are essentially burlesque figures. In her patented persona as an old woman lapsing into dementia, Edna Doré becomes a linchpin about whom the others revolve, with Sheen taking acting honours with her finely nuanced performance as a societal rebel beginning to crave, albeit non-bourgeois, motherhood. Cinematographer Roger Pratt, along with ever inventive Leigh, use closeups to potent effect for a film that would more nearly approach greatness if a hammy lack of restraint from some talented players, although frequently highly comic, would have received closer directoral oversight. 7 of 10 people found this review helpful. Was this review helpful to you?